Fully renovated from top to bottom as of Nov 2018. Our home is a two bedroom, two bathroom, three level townhome in Stoney Creek Sunpath centrally located just steps from the Village Stroll, the Marketplace and only a short walk to the lifts. The entrance with small mudroom is located on the ground floor with stairs leading immediately up to the second floor open concept living area that features a modern gas fireplace, comfy sectional sofa and flat screen TV mounted above the fireplace. There is sliding door access to a private balcony. The kitchen features new cabinets, stainless steel appliances and quartz counters. The dining table comfortably seats 6. The top level balcony accessed from the master bedroom features a hot tub but the complex also features a common area hot tub and outdoor salt water pool. Both guest bedrooms and bathrooms are located on the top level. The master bedroom features a queen bed, closet and access to the private deck with hot tub. The second bedroom features a solid wood bunk bed with a double XL on top and a queen bed on the bottom. The first separate bathroom features a new alcove bathtub with a glass sliding door, rainhead shower and a single vanity. The adjacent second separate bathroom on this floor features a glass-enclosed shower with a rainhead shower and a single vanity. 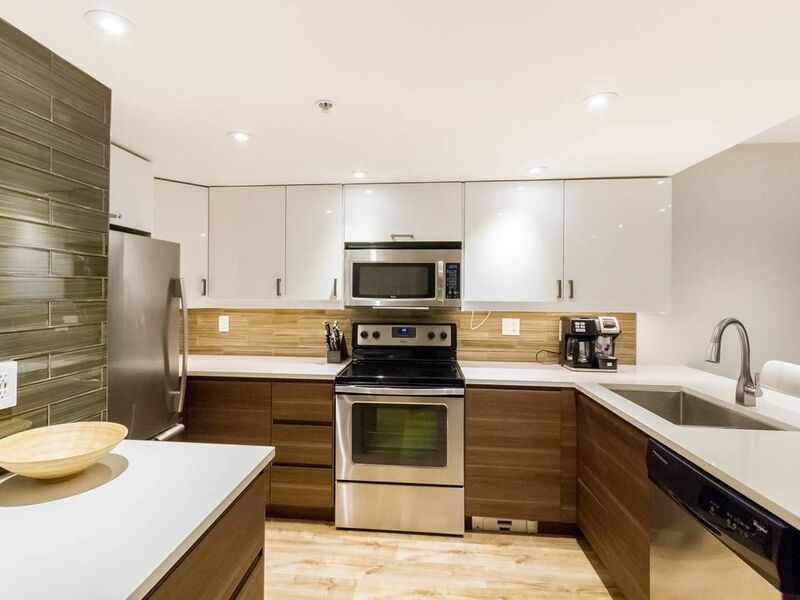 This unit features an in-suite washer and dryer, free wireless internet and underground parking for one vehicle, other parking may be available where there is no "reserved" signage. This home is perfect for a small family or group of friends with its central location for year round stays. We are working professionals that really enjoy coming up to whistler and enjoy outdoor activities, so we had to have a little piece of heaven in Whistler! We stayed at a friends townhouse in the next complex over and were amazed how close it was to all the action in the village, yet far enough (across the street) to enjoy the peace and quiet and enjoyment with our family. No noise from the late night revelers!! We like to come to our townhouse in Whistler as much as time permits, so we have outfitted it the way we can just come and put our feet up and have all the necessities and pleasures and enjoy our stay. Make any type of breakfast, lunch, and dinners with a fully equipped kitchen and barbecue. We also have a hot tub that you can enjoy in the privacy of your own place, and for more action, hit the common heated pool and hot tub. Both bathrooms have been fully renovated with new custom glass doors, single sink vanities, plumbing fixtures, illuminated LED mirrors, floating shelves and heated porcelain tiled floors. Steps to the main Village stroll! See beautiful views from the patio of Whistler/Blackcomb! Shaw Home Phone with unlimited calls within Canada and the US. Electric baseboard heating controlled by Mysa smart thermostats. Nuheat floors in bathrooms and main entry way. Bedding and hypoallergenic pillows provided. LG front-load washer in graphite steel. Detergent is provided. LG front-load dryer with Electric steam drying capabilities in graphite steel. Savannah 36” Linear Gas fireplace with fan and remote. One reserved parking spot included. Additional vehicles can park in an unreserved stall, on a first come first serve basis. Height of the underground parkade is 2.0m Clearance 6’8”. Shaw High-Speed & Broadband Internet with 150Mbps. Bath, Kitchen and Pool/Hot Tub towels provided. Sectional Sofa with seating for 5. Lutron Caseta smart LED lighting and motorized roller blinds. Hamilton Beach FlexBrew 2-Way and Moka Pot. Newly renovated and fully stocked kitchen with quartz countertops. Great room style open floor plan. Dining table seats 6 people and kitchen counter has 3 bar stools. Samsung 50” 4K Smart TV in living room. Samsung 40” 4K Smart TV in each bedroom. Shaw Cable package with a variety of channels including HD channels. Netflix and Prime Video are also available. Sonos Beam smart sound bar pairs with tv, Amazon Alexa voice control & airplay compatible with iOS devices. 2 Decks - 1 on main floor off dining room and 1 on top floor off master bedroom. Less than 10 min walk to the ski lifts, free shuttle across the street as well! Less than 10 min walk to Whistler Golf Club and 6 min drive to Nicklaus North Golf Course. Not included in the rental. 3 Level home with 2 sets of stairways and private entrance. Year round salt water pool is open daily from 8am to 10pm. The area is locked, key/fob required for access and to turn on hot tub jets. Common area hot tub plus a private hot tub on deck off master bedroom. Nicest place we’ve stayed in 30 years! Honesty, the best place we’ve ever stayed. Gorgeously decorated and remodeled. Everything was there from blow dryer to a fully stocked kitchen. Abundant of towels. So nice. And best location. Across the street from bus to lifts. Owners were attentive and amazing! Our family of four had a wonderful stay during our week in Whistler. Sunpath was very convenient to everything in the village. I can’t think of a single amenity that wasn’t provided. Every detail has been thought through, including the mud room with hooks, boot dryers, umbrellas, wagon (that we used to haul groceries) hot tub towels, fully stocked kitchen, etc. We loved the updated decor, automatic blinds and motion lighting. Everything was very high tech! Thank you for making our stay so comfortable. We highly recommend and hope to be back soon! Perfect location, very responsive owner, clean and well stocked unit. Family already wants to come back next year. Thank you Keith. We look forward to hosting you again! We thoroughly enjoyed our stay at David and Elisa wonderful property. It’s a spacious modern townhouse. The kitchen was well equipped with everything we needed. We loved the hot tub off the main room, it was perfect! Also loved being so close to the restaurants and shops. Hopefully we will get back to Whistler again soon and stay here again. Thank you. Thank you Lisa. We are pleased to hear that you enjoyed your stay. We hope to host you and your family again soon! This is the second stay I have had at this townhome - once prior to the renovations (November 2017) and now since the renovations have been complete (January 2019). Great location with thoughtful beautiful upgrades have been done. A great place to stay! The owners were able to provide great suggestions on near by activities and restaurants. Thanks for a beautiful stay - amazing home away from home! Thank you Patty for staying with us again and your compliments about the upgrades. We hope you and your family will visit again soon!